Carex is a vast genus of more than 2,000 species of grassy plants in the family Cyperaceae, commonly known as sedges (or seg, in older books). Other members of the Cyperaceae family are also called sedges, however those of genus Carex may be called true sedges, and it is the most species-rich genus in the family. The study of Carex is known as caricology. All species of Carex are perennial, although some species, such as C. bebbii and C. viridula can fruit in their first year of growth, and may not survive longer. They typically have rhizomes, stolons or short rootstocks, but some species grow in tufts (caespitose). The culm – the flower-bearing stalk – is unbranched and usually erect. It is usually distinctly triangular in section. The leaves of Carex comprise a blade, which extends away from the stalk, and a sheath, which encloses part of the stalk. The blade is normally long and flat, but may be folded, inrolled, channelled or absent. The leaves have parallel veins and a distinct midrib. Where the blade meets the culm there is a structure called the ligule. The colour of foliage may be green, red or brown, and "ranges from fine and hair-like, sometimes with curled tips, to quite broad with a noticeable midrib and sometimes razor sharp edges". In this Carex panicea, the upper spike contains male flowers, and the lower spike contains female flowers. The flowers of Carex are small and are combined into spikes, which are themselves combined into a larger inflorescence. The spike typically contains many flowers, but can hold as few as one in some species. Almost all Carex species are monoecious; each flower is either male (staminate) or female (pistillate). A few species are dioecious. 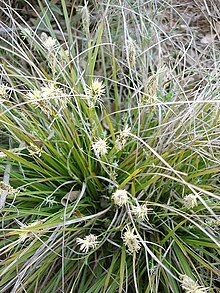 Sedges exhibit diverse arrangements of male and female flowers. Often, the lower spikes are entirely pistillate and upper spikes staminate, with one or more spikes in between having pistillate flowers near the base and staminate flowers near the tip. In other species, all spikes are similar. In that case, they may have male flowers above and female flowers below (androgynous) or female flowers above and male flowers below (gynecandrous). In relatively few species, the arrangement of flowers is irregular. The defining structure of the genus Carex is the bottle-shaped bract surrounding each female flower. This structure is called the perigynium or utricle, a modified prophyll. It is typically extended into a "rostrum" or beak, which is often divided at the tip (bifid) into two teeth. The shape, venation, and vestiture (hairs) of the perigynium are important structures for distinguishing Carex species. The fruit of Carex is a dry, one-seeded indehiscent achene or nut which grows within the perigynium. Perigynium features aid in fruit dispersal. Carex species are found across most of the world, albeit with few species in tropical lowlands, and relatively few in sub-Saharan Africa. Most (but not all) sedges are found in wetlands – such as marshes, calcareous fens, bogs and other peatlands, pond and stream banks, riparian zones, and even ditches. They are one of the dominant plant groups in arctic and alpine tundra, and in wetland habitats with a water depth of up to 50 cm (20 in). The genus Carex was established by Carl Linnaeus in his work Species Plantarum in 1753, and is one of the largest genera of flowering plants. Estimates of the number of species vary from about 1100 to almost 2000. Carex displays the most dynamic chromosome evolution of all flowering plants. Chromosome numbers range from n = 6 to n = 66, and over 100 species are known to show variation in choromosome number within the species, with differences of up to 10 chromosomes between populations. Several fossil fruits of two Carex species have been described from middle Miocene strata of the Fasterholt area near Silkeborg in Central Jutland, Denmark. Carex species and cultivars are popular in horticulture, particularly in shady positions. Native species are used in wildland habitat restoration projects, natural landscaping, and in sustainable landscaping as drought-tolerant grass replacements for lawns and garden meadows. Some require damp or wet conditions, others are relatively drought-tolerant. Propagation is by seed or division in spring. Species serve as a food source for numerous animals, and some are used as a livestock hay. ^ Ilkka Kukkonen; Heikki Toivonen (1988). "Taxonomy of wetland carices". Aquatic Botany. 30 (1–2): 5–22. doi:10.1016/0304-3770(88)90003-4. ^ Andrew L. Hipp (2007). "Nonuniform processes of chromosome evolution in sedges (Carex: Cyperaceae)" (PDF). Evolution. 61 (9): 2175–2194. doi:10.1111/j.1558-5646.2007.00183.x. PMID 17767589. ^ a b c d e f g h i j Robert H. Mohlenbrock; Paul Wayne Nelson (1999). "Introduction". Sedges: Carex. Volume 14 of The Illustrated flora of Illinois. Southern Illinois University Press. pp. 3–7. ISBN 978-0-8093-2074-5. ^ a b c d e f Peter W. Ball; A. A. Reznicek (2002). "Carex Linnaeus, Sp. Pl. 2: 972. 1753; Gen. Pl. ed. 5, 420. 1754". Magnoliophyta: Commelinidae (in part): Cyperaceae. Flora of North America North of Mexico. 23. Oxford University Press. pp. 254–258. ISBN 978-0-19-515207-4. ^ Amjad Almusaed (2010). Biophilic and Bioclimatic Architecture: Analytical Therapy for the Next Generation of Passive Sustainable Architecture. Springer. p. 52. ISBN 978-1-84996-534-7. ^ a b c d A. C. Jermy; D. A. Simpson; M. J. Y. Foley; M. S. Porter (2007). "General structure of Cyperaceae". Sedges of the British Isles. BSBI Handbook No. 1 (3rd ed.). Botanical Society of the British Isles. pp. 2–26. ISBN 978-0-901158-35-2. ^ David G. Frodin (2004). "History and concepts of big plant genera". Taxon. 53 (3): 753–776. doi:10.2307/4135449. JSTOR 4135449. ^ Andrew L. Hipp; Paul E. Rothrock; Eric H. Roalson (2009). "The evolution of chromosome arrangements in Carex (Cyperaceae)" (PDF). The Botanical Review. 75 (1): 96–109. doi:10.1007/s12229-008-9022-8. ^ a b c Julian R. Starr; Stephen A. Harris; David A. Simpson (2008). "Phylogeny of the unispicate taxa in Cyperaceae Tribe Cariceae II: the limits of Uncinia". In Robert F. C. Naczi; Bruce A. Ford (eds.). Sedges: Uses, Diversity, and Systematics of the Cyperaceae (PDF proof). Monographs in Systematic Botany. 180. Missouri Botanical Garden Press. ISBN 978-1-930723-72-6. ^ a b c Dai Lunkai; Liang Songyun; Zhang Shuren; Tang Yancheng; Tetsuo Koyama; Gordon C. Tucker. "33. Carex Linnaeus, Sp. Pl. 2: 972. 1753. 薹草属 tai cao shu". Acoraceae through Cyperaceae (PDF). Flora of China. 23. Harvard University Press. pp. 285–461. ^ Judy Lowe (2012). "Carex". Tennessee & Kentucky Garden Guide: the Best Plants for a Tennessee or Kentucky Garden (2nd ed.). Cool Springs Press. p. 178. ISBN 978-1-59186-537-7. ^ Frances Tenenbaum, ed. (2003). "Carex". Taylor's Encyclopedia of Garden Plants. Houghton Mifflin Harcourt. pp. 74–75. ISBN 978-0-618-22644-3. ^ "Grasses and grasslike plants". Native Sons. Retrieved May 22, 2010. ^ RHS A-Z encyclopedia of garden plants. United Kingdom: Dorling Kindersley. 2008. p. 1136. ISBN 1-4053-3296-4. ^ a b "Bruk av land og vann i Finnmark i historisk perspektiv" [The use of land and water in Finnmark in historical perspective]. Norges Offentlige Utredninger (in Norwegian). Norwegian Ministry of Justice and Public Security. 1994 (21). 1994. ^ Ole Mathismoen (December 14, 2011). "Blir ikke varm i rått reinskinn". Aftenposten (in Norwegian). p. 17. ... skalder med senegress fra Kautokeino til bruk når de hadde slått leir. ^ Borchgrevink, Carston (1980). First on the Antarctic continent. Being an account of the British Antarctic Expedition, 1898 – 1900. London: Hurst and Co.
^ Ronald W. Crites; E. Joe Middlebrooks; Sherwood C. Reed (2005). Natural Wastewater Treatment Systems. CRC Press. p. 263. ISBN 978-1-4200-2644-3. ^ Heinjo Lahring (2003). Water and Wetland Plants of the Prairie Provinces. University of Regina Press. p. 114. ISBN 978-0-88977-162-8. ^ Joel Greenberg (2010). Of Prairie, Woods, and Water: Two Centuries of Chicago Nature Writing. ReadHowYouWant.com. p. 206. ISBN 978-1-4596-0615-9. 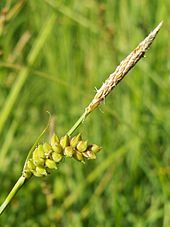 Wikimedia Commons has media related to Carex. eMonocot Cyperaceae, a portal to updated classification, images, species descriptions, and vetted specimen data for the entire sedge family, with a strong focus on Carex.